24 in. 31.5 in. 40 in. 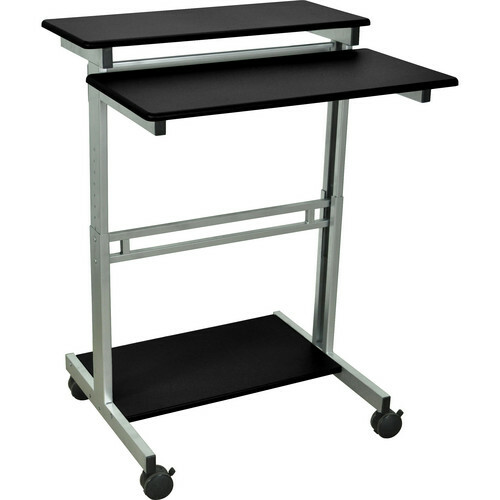 The 31.5" black Stand-Up Workstation from Luxor is a rolling cart with three shelves that's able to support a desktop, laptop, or tablet. Constructed with a steel frame, the Stand-Up Workstation allows you to adjust the height of the top and middle shelves in 1" increments to suit your working comfort. Four 3" casters, two of which are lockable, allow you to move this workstation to your chosen location. All the tools and hardware required for assembly are included. Box Dimensions (LxWxH) 34.75 x 27.0 x 6.0"
Stand-Up Workstation (Black, 31.5") is rated 4.3 out of 5 by 3. Rated 4 out of 5 by Anonymous from Sturdy, Attractive, and Simple We have two of these stations, used for public access to the Internet in our Community Media facility. One is set up at standing height, the other at a seated level. What I liked: The workstations were very easy to put together, and the instructions were well done. I like the finish on the table surfaces, and on the metal supports. They seem like a good bargain for the price. On the con side: The locking casters don't seem to lock very solidly, and the lower table surface doesn't leave much room for feet when a user is sitting at the station, so it becomes a foot rest, which I suspect will eventually loosen the connections of that piece. Rated 5 out of 5 by Anonymous from Solid great looking product Very good quality on the wood lamination. Sturdy and simple to put together. As others noted to adjust the size you need to dissemble a bit but I got it right the first time. Top and keyboard are a great size for large keyboards and monitors. Very happy with the purchase here.